Produced by Global Garden Friends, this nifty little gizmo allows you to quickly and easily fasten a plant stem in place with only one hand. Simply hold the curved ends with your thumb and index finger, press them together, and presto – the clip locks together. It’s simple to clip a stem in place – no cutting or tying required. The plant clip is made of 100% recyclable plastic and stands up well to repeated use and exposure to sun and temperature fluctuations. I used some of the Ultimate Plant Clips to hold together stems on an overgrown climbing rose. Despite strong winds that whipped the plant around, blazing sun in summer, and snow and ice in winter, the plant clips look exactly as they did when I first got them a year ago – they didn’t fade or come apart. Just press your thumb and index finger together and presto – the clip locks in place. The clips were designed to secure plant stems up to 1/2″ in diameter which means that they can be used on most vines, vegetables, perennials, and even some shrubs. You can leave the clips on your plants without worrying about compressing or girdling the stem as it grows. According to the company, the Ultimate Plant Clip has a patented design that allows it to expand with your plant while still keeping it securely fastened. While I really like this plant clip for its ease of use and durability, I’m not so fond of the color. It’s such a bright green that it stands out like a sore thumb on some plants (the company says that the color allows it to blend in easily with all of your plants, but that’s not really the case). The color has both pros and cons – you can easily find the clips when you want to remove or reposition them, but they can also be quite visible (and that might not be a “look” you’re comfortable with). The other thing to keep in mind is that these clips are made of hard plastic. Unlike some other materials used for securing plant stems (such as tape), it’s possible that over time the clip will rub back and forth and damage the bark or outer layers of the stem. This isn’t an issue for annuals or perennials that die back each winter, but it could affect shrubs or vines. I did notice some minor bark damage on the roses that were held in place with the clips, although this was likely due to the fact that the overgrown stems were frequently whipped around by wind over the winter. Overall, I recommend the Ultimate Plant Clip for use with annual, vegetables, and perennials. For plants with woody stems, I’d use the clips in areas where the plant is protected from strong winds. The Ultimate Plant Clip is available directly from Global Garden Friends through their online store for only $9.99 for 50 clips. 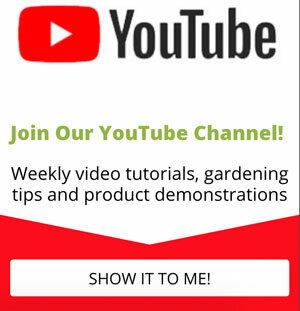 But, as a special offer for readers of the Gardening Product Review, you can buy the Ultimate Plant Clips with a special 25% discount by typing in the word GROW when you checkout. (Note: At the time I wrote this, the Ultimate Plant Clips were out of stock on Amazon – just thought I’d mention that…). This is a great idea. I will test out the clips in my various gardens. It will be helpful with flowers, tomatoes, and other plants. Great, glad you like the idea. Let us know how they work for you! Good point Stacy – sometimes a highly visible color in the garden is a good thing!